44 (29 July 1905), Den Haag, Netherlands. Linesmen - Mario Gardelli, Brazil & Gunnar Dahlner, Sweden. ELO rating 2nd Colours: The 1949 home uniform - White collared short-sleeved jerseys, blue shorts, black socks with white tops. 30th match, W 23 - D 3 - L 4 - F 102 - A 31. 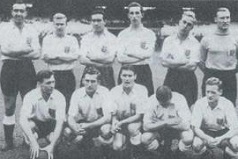 Team announced by Arthur Drewry on Friday, 23 June 1950.
team notes: A list of firsts for England - first World Cup Finals match, first match in South America, first South American opposition, Mortensen scores the first World Cup Finals goal for England. He becomes the youngest scorer of an England goal at the World Cup Finals, aged 29 years and 30 days, and Mannion becomes the oldest at 32 years and 40 days. This is also Billy Wright's record thirtieth consecutive appearance, he had injured his left knee which required three minutes' treatment while Mortensen replaced him. He also becomes the youngest player to reach thirty appearances, 26 years and 139 days, taking four years of Eddie Hapgood's record. Laurie Hughes is the first England player to win his first cap in the World Cup Finals. The entire team wore oxygen masks during the half-time break. Finney, Mannion, Bentley, Mortenson, Mullen. ELO rating 28th to 30th Colours: Red v-necked jerseys, blue shorts, white socks. team notes: Chile qualified without playing a match because of the withdrawal of Argentina from its qualifying group. This long-awaited first World Cup finals match for the England team was played in pouring rain in front of an estimated crowd of 50,000 - although the official attendance given by the Brazilian FA was much less than that. England sprag a surprise by selecting Laurie Hughes of Liverpool to win his first cap. It was a tough match in which to make an international debut but Hughes acquitted himself well. The football was disappointing. The England attack never really got going and the defence found the Chilean forward line lively, albeit weak in front of goal. It was England who went ahead in the 38th minute. A centre by Jimmy Mullen found Stan Mortensen and he gave Livingstone no chance with a firm header. England enjoyed territorial advantage for most of the first half but Chile were unlucky when Carvelho hit the bar and again when Robledo, the Newcastle centre-forward, who led the Chilean side, hit the post with a 30-yard free-kick. Chile employed some robust tactics in the second half and the England players found it difficult to get into any sort of rhythm. Billy Wright and Wilf Mannion strove manfully, though, and England still remained in a comfortable position. It was their turn for some bad luck in this half as they hit the bar twice. Roy Bentley and Mortensen both went close with headers and the two England forwards had looked sharp. Robledo was Chile's main threat, but midway through the second half, England scored their decisive second goal. Mortensen sent Finney away down the right and his cross was put neatly inside the post with a low shot by Mannion. England made a far from impressive start to their World Cup campaign against Chile but got away with a victory. The vast Maracana Stadium, with workmen still putting the finishing touches, held 200,000 spectators and it looked and sounded deserted with fewer than 30,000 watching the game. The FA saw fit to organise a goodwill tour of Canada at the same time as the World Cup finals in Brazil, and then 'ummed' and 'ahhed' when Manchester United requested that none of their players should be considered because they had arranged a trip to the United States. Walter Winterbottom, battling against this blinkered club-before-country attitude, almost had to get on his knees to have first choice for the World Cup. As it was, he had to go to Brazil without without England's most famous player, Stanley Matthews, who was sent on the totally meaningless Canadian trip as a footballing ambassador. Special arrangements had to be made to fly him down to Rio for the World Cup, and he arrived after England had won this opening match 2-0 against Chile. Laurie Hughes replaced his Liverpool clubmate Bill Jones at centre-half. He won three England caps, all in this World Cup tournament. Stan Mortensen gave England a thirty-eighth minute lead against the run of play when he headed in a Jimmy Mullen cross. [Mannion] turned goal scorer just after the hour when he drove the ball into the net following neat approach work by Mortensen and Tom Finney. George Robledo, the Newcastle forward playing for his home country of Chile, rattled the England woodwork with a 30-yard free-kick, and neutral observers thought the Chileans unlucky not to get at least a draw. But an easier match against the USA was to follow! Attendance: Most sources, including the FIFA match report, list the attendance as around 30,000. Many commentators believe it was quite a bit higher, with estimates ranging from 45,000 to 65,000 [Duarte]. Goal times: The times given for the goals also vary widely, ranging from 27 to 39 minutes for Mortensen's and 51 to 70 minutes for Mannion's. We have used the times from the FIFA match report, which are the same as or within a minute of the times given in the vast majority of the reports. England lineup: Some sources, including the FIFA match report, have Mortensen playing inside right and Mannion inside left. Leatherdale's authoritative work on England's World Cup history notes that Mortensen switched to inside right from inside left only for England's last World Cup 1950 match against Spain, when Mannion was left out and Eddie Baily brought in. Both the latest Football Association yearbooks and Rothman's Book of Football Records also have Mannion at inside right and Mortensen at inside left. Chile lineup: Many European sources, including the FIFA match report, have Arturo Farias as right back and Fernando Roldán as right half. The exception is the lineup appearing in the World Cup history on La Gazzetta dello Sport website, which has Roldán as right back and Farias as right half. This coincides with the positions attributed to Chile Party members by South American sources; Roldán was a fullback and Farias a halfback. George Robledo was born in Chile of a Chilean father and Yorkshire mother, but grew up in England to become a fine goalscorer for Barnsley and Newcastle United. Chile recruited him for the World Cup 1950 finals, and George became Jorge although he did not speak Spanish. When he hit the post against England, one of his opponents reputedly said, "Steady, George, you're not playing for Newcastle now, you know." 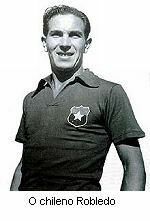 At the end of his contract with Newcastle in 1953, Robledo returned to Chile and eventually served as the national side's coach. He scored 127 goals in 251 Football League matches, led the old First Division with 33 goals in the 1951-52 season, won F.A. Cup winners medals with Newcastle in 1951 and 1952 and scored the only goal in the 1952 Cup Final. He died in 1989.